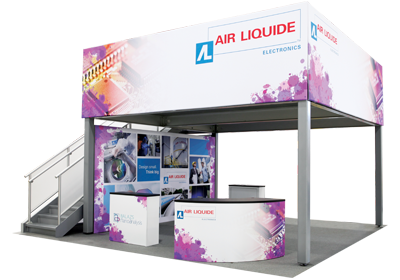 Engage your audience inside this 20' x 20' island display at your next event! Formulate® Fusion Kit 08 provides ample floor space for traffic flow, product demonstrations and semi-private meetings. The main arch structure is 15' 8" tall and has a footprint that spans 27' 3", which requires that it is placed in a 20' x 20' exhibit space on a diagonal. Two oval-shaped accents mounted on the sides of the arch provide areas for company branding and messaging. 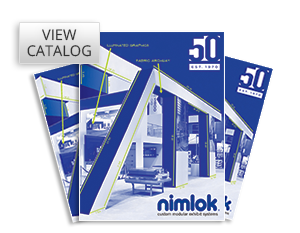 Two structural accent displays are placed on the inside of the archway anchors, each featuring three 29.5" illuminated squares that can be used to feature product or service images, taglines, branding and more. 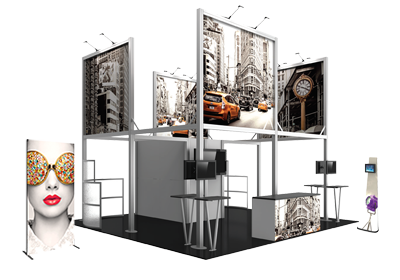 These displays stand 105" tall and are 42" wide. Host meetings in the semi-private conference room, which can fit a 36" diameter bistro style table four chairs or stools. The oval fabric counter can be used for reception and storage.